They Were Her Property is a bold and searing investigation into the role of white women in the American slave economy. A bold and searing investigation into the role of white women in the American slave economy. Bridging women's history, the history of the South, and African American history, this book makes a bold argument about the role of white women in American slavery. 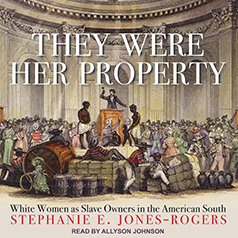 Historian Stephanie E. Jones–Rogers draws on a variety of sources to show that slave–owning women were sophisticated economic actors who directly engaged in and benefited from the South's slave market. Because women typically inherited more slaves than land, enslaved people were often their primary source of wealth. Not only did white women often refuse to cede ownership of their slaves to their husbands, they employed management techniques that were as effective and brutal as those used by slave–owning men. White women actively participated in the slave market, profited from it, and used it for economic and social empowerment. By examining the economically entangled lives of enslaved people and slave–owning women, Jones–Rogers presents a narrative that forces us to rethink the economics and social conventions of slaveholding America.